In a large Dutch oven, melt butter over medium-high heat. Cook onion until translucent, 4 to 6 minutes. Add celery, bell pepper, carrot, and jalapeño; cook until soft, 6 to 8 minutes. Add garlic, red pepper, cayenne, salt, and pepper; stir until fragrant, about 1 minute. Pour in seafood stock, and scrape up any browned bits from bottom of pan. 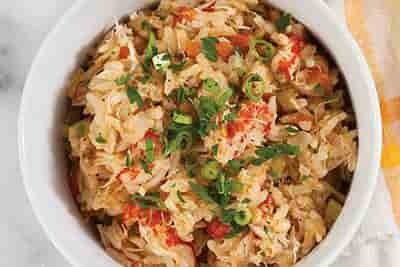 Stir in hot-cooked rice, lemon juice, Worcestershire sauce, crawfish, and crabmeat. Cook 12 to 14 minutes, stirring occasionally. Garnish with green onion and parsley, if desired. Recipe courtesy of Louisiana Seafood and Marketing Board. Photo courtesy of Hoffman Media.